We awaken to a white world of snow. Nature has brought another miracle. But our minds still say it’s a miracle. Happenings that transcend daily life. For us this came just the other night. We were struck by an other-worldly vision. Or it seemed even three. There between our house and garage. Could this have been our imagination? No, we are rational my wife and I. Neither of us have ever seen a ghost. No, it was a real giant white rabbit. Snooping indifferently around the yard. The apparition was gone in a second. Our mouths were wide open in wonder. We’ll never forget that holiday evening. And to have witnessed the great white rabbit. P.S. 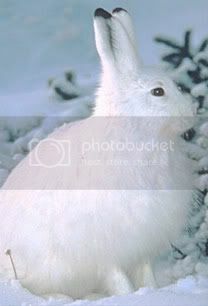 You’ll say it was just a snowshoe hare, also known as the varying hare, capable of changing its summer pelage from puff brown to almost pure white….But everyone knows they are invisible. J.B. This entry was posted in Family, Nostalgia, Short Story, Slice of life and tagged Christmas memories, Christmas poetry, Christmas story, John Borel, nature and Christmas, nostalgia, poetry, Snowshoe Hare. Bookmark the permalink.